The sky above Paranal on 21 July 2007. Two 8.2-m telescopes of ESO's VLT are seen against the wonderful backdrop of the myriad of stars and dust that makes the Milky Way. Just above Yepun, Unit Telescope number 4, the Small Magellanic Cloud - a satellite galaxy of the Milky Way - is shining. A laser beam is coming out of Yepun, aiming at the Galactic Centre. It is used to obtain images that are free from the blurring effect of the atmosphere. 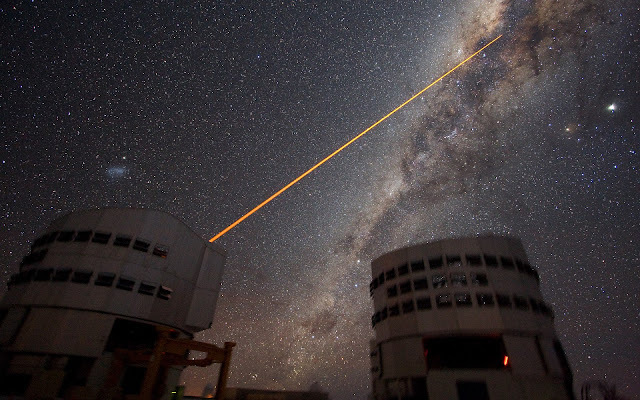 On this image, the laser beam looks slightly artificial. This is a side effect due to saturation caused by the long exposure time. Planet Jupiter is seen as the brightest object on the upper right, next to the star Antares. Image taken by ESO astronomer Yuri Beletsky. The Sun is a moving target. Its annual motion through planet Earth's sky tracks north and south, from solstice to solstice, as the seasons change. 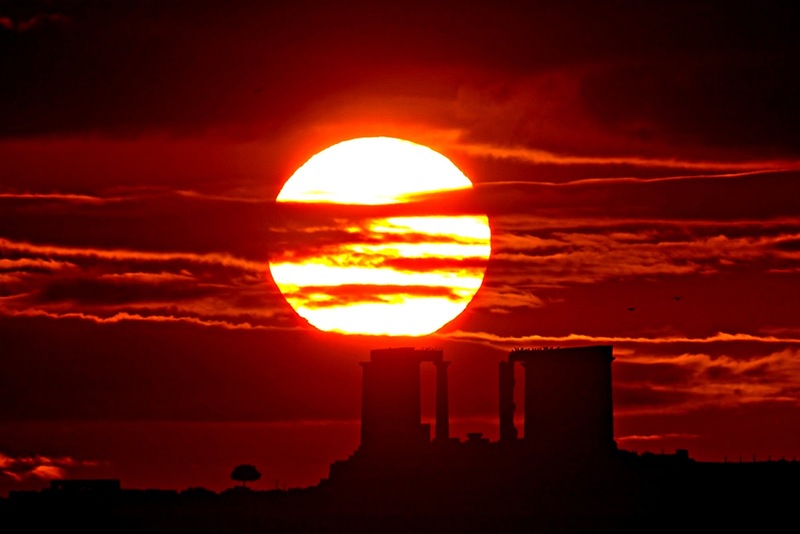 On December 21st, the solstice marking the first day of winter in the northern hemisphere and summer in the south, the Sun rose at its southernmost point along the eastern horizon. 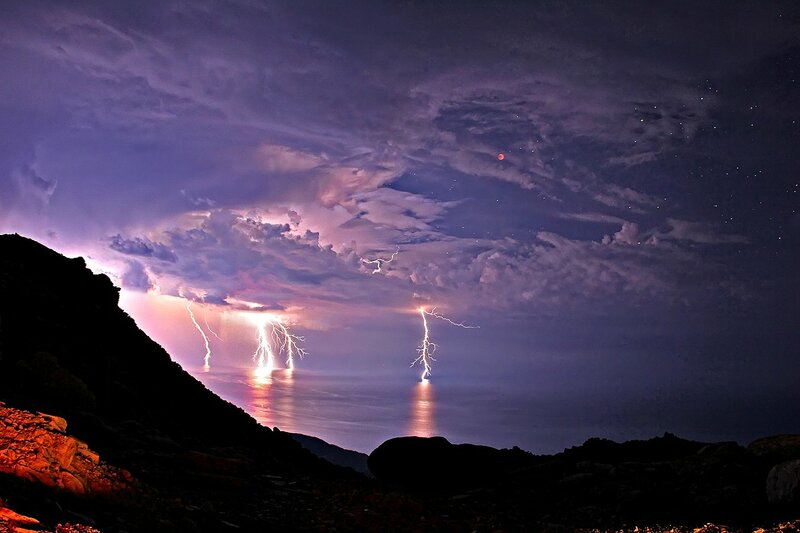 Earlier December, 2009, looking toward the Aegean Sea from a well-chosen vantage point at Cape Sounion, Greece, it also rose in this dramatic scene. In the foreground lies the twenty-four hundred year old Temple of Poseidon. What kind of clouds are these? Although their cause is presently unknown, such unusual atmospheric structures, as menacing as they might seem, do not appear to be harbingers of meteorological doom. Known informally as Undulatus asperatus clouds, they can be stunning in appearance, unusual in occurrence, are relatively unstudied, and have even been suggested as a new type of cloud. Whereas most low cloud decks are flat bottomed, asperatus clouds appear to have significant vertical structure underneath. 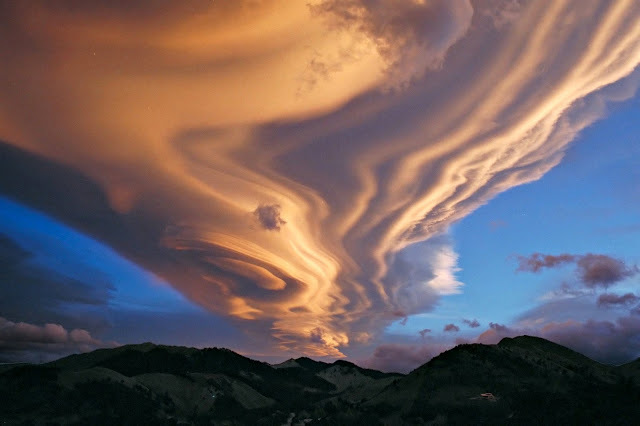 Speculation therefore holds that asperatus clouds might be related to lenticular clouds that form near mountains, or mammatus clouds associated with thunderstorms, or perhaps a foehn wind - a type of dry downward wind that flows off mountains. Such a wind called the Canterbury arch streams toward the east coast of New Zealand's South Island. 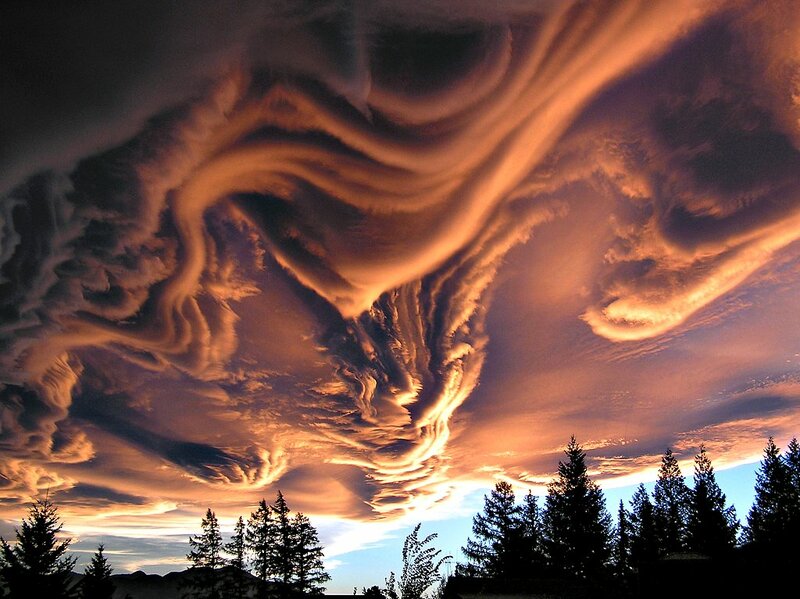 This image, taken above Hanmer Springs in Canterbury, New Zealand, in 2005, shows great detail partly because sunlight illuminates the undulating clouds from the side. A supercell is a thunderstorm that is characterized by the presence of a mesocyclone: a deep, persistently rotating updraft. For this reason, these storms are sometimes referred to as rotating thunderstorms. Of the four classifications of thunderstorms (supercell, squall line, multi-cell, and single-cell), supercells are the overall least common and have the potential to be the most severe. Supercells are often isolated from other thunderstorms, and can dominate the local climate up to 32 kilometres (20 mi) away. Moonlight illuminates a snowy scene in this night land and skyscape made on January 17, 2013 from Lower Miller Creek, Alaska, USA. Overexposed near the mountainous western horizon is the first quarter Moon itself, surrounded by an icy halo and flanked left and right by moondogs. Sometimes called mock moons, a more scientific name for the luminous apparitions is paraselenae (plural). 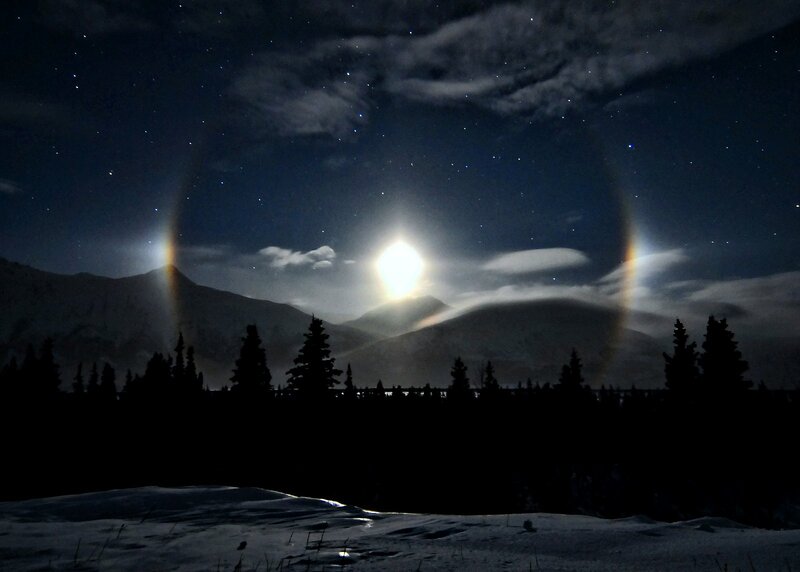 Analogous to a sundog or parhelion, a paraselene is produced by moonlight refracted through thin, hexagonal, plate-shaped ice crystals in high cirrus clouds. As determined by the crystal geometry, paraselenae are seen at an angle of 22 degrees or more from the Moon. Compared to the bright lunar disk, paraselenae are faint and easier to spot when the Moon is low. What's happening above those mountains? Several clouds are stacked up into one striking lenticular cloud. Normally, air moves much more horizontally than it does vertically. Sometimes, however, such as when wind comes off of a mountain or a hill, relatively strong vertical oscillations take place as the air stabilizes. The dry air at the top of an oscillation may be quite stratified in moisture content, and hence forms clouds at each layer where the air saturates with moisture. The result can be a lenticular cloud with a strongly layered appearance. This picture was taken in 2002 looking southwest over the Tararua Range mountains from North Island, New Zealand.